Our parrots went crazy over this toy ... of course, they are very fond of balsa but the Balsa in a Blanket offers a different twist! 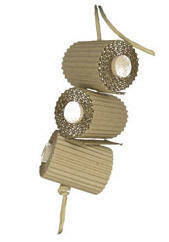 The balsa poles are wrapped up with 3" corrugated wrap for added texture and beak pleasing shredding. Strung on paper rope this destroyable toy is sure to put a smile on your parrot's beak! !